The ups and downs of the presidential candidates’ negotiation behaviors. There is “nothing worse than a debate about debates,” John Podesta, the chairman of Hillary Clinton’s presidential campaign, recently said in the midst of his candidate’s heated negotiations with Democratic rival Bernie Sanders about the terms of their debates. Many who participated in these negotiations would likely agree. But the debates about debates—both on the Democratic and Republican side of the race—led to both admirable and questionable negotiation behaviors that suggest key lessons for professional dealmakers. 1. Make threats with caution. In the fall of 2015, Republican candidates Donald Trump and Ben Carson used their leverage as the leading candidates from their party to push CNBC for changes to the format of a debate the network would be hosting in Boulder, Colorado, on October 28. Dissatisfied by a three-hour Republican debate held in California in September, Trump and Carson threatened to withdraw from the Boulder debate unless CNBC agreed to shorten the debate from three hours to two hours and to allow each candidate to deliver opening and closing statements. CNBC met their demands. In negotiation, power is often related to how much your counterpart values you as a negotiating partner. Calculating that they were indispensable to CNBC—and that they could risk missing one debate so early in the election season—Trump and Carson were able to make a credible and effective threat that assisted them in claiming value. In business negotiations, threats can easily backfire, working against building trust in negotiations, and generally should be used as a last resort. To issue a threat successfully, make sure it is credible, be prepared to follow through on it, and deliver it when you are in a calm state of mind. 2. Form coalitions with competitors. Notably, Trump and Carson opted to negotiate jointly to increase their bargaining power with CNBC. “The campaigns have figured out if they act collectively they can effect change,” the New York Times reported. 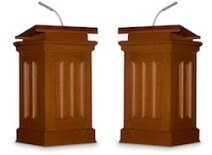 Other candidates followed their lead after exiting the debate state believing the moderators had been biased and rude. Representatives from most of the 10 Republican frontrunners met privately and agreed to negotiate directly and collectively with future debate sponsors, taking over this duty from the Republican National Committee. Barry Bennett, Ben Carson’s campaign manager, told National Public Radio that the campaigns would hold a group conference call with the broadcast sponsor before each debate to review details of the format. In negotiation, as in many realms of life, strength often comes in numbers. By agreeing to engage in deal design jointly, the Republicans made it much more difficult for their future negotiating counterparts to ignore their demands. The debate sponsors might have been willing to risk losing one or two candidates, but they couldn’t risk losing most of them. Notably, Trump opted out of the new coalition, saying he would negotiate debate terms with TV networks on his own going forward. Trump’s confidence in his ability to go it alone reflects his self-styled reputation as a master negotiator and lead position in the Republican pack at the time. Saying that Trump was free to make his own demands, Carson campaign manager Bennett said, “Trump’s basically asking for the same thing—he’s just going to do it with his own letterhead,” according to the Washington Post. 3. Don’t let heated emotions take over. Trump once again took center stage in Republican debate negotiations when he announced he would boycott a scheduled January 28 debate in Des Moines, Iowa, unless Fox agreed to replace Fox News anchor Megyn Kelly with another moderator. For many months, Trump had heaped criticism on Kelly for what he said was unfair questioning of him during her moderation of the first Republican debate in August 2015. Fox, concerned viewers wouldn’t tune in without Trump on stage in Iowa, reportedly engaged in intense internal discussions about how to handle his threat. Ultimately, the network doubled down, not only refusing to meet his demand but also mocking him on Twitter for his stance against Kelly. An angered Trump announced he would indeed boycott the debate. A few days after the debate, Trump came in second place in the Iowa caucuses, a disappointing finish that he himself conceded could have been due to his absence from the Des Moines debate, as reported by CNN. In negotiation, it can be tempting to let our emotions escalate over perceived slights and unfair treatment. The result can be rash behavior, such as insulting or mocking the other party, or storming away from the table. Such moves work against building trust in negotiations and creating value in negotiation. Wise negotiator stay work to manage their emotions and stay focused on their primary goals. 4. Examine possible tradeoffs with an open mind. The two main Democratic candidates, Clinton and Sanders, engaged in their own lively negotiations over debates this winter. Sanders repeatedly had called for the Democratic National Committee to add more debates to its lineup, believing the relatively light debate schedule favored Clinton as frontrunner. Clinton, for her part, was eager to debate Sanders in New Hampshire, were she trailed him, prior to that state’s primary, the first in the nation. The situation was ripe for a trade, and the candidates ultimately found it: Sanders agreed to a New Hampshire debate, and Clinton agreed to participate in three more debates in the spring. Media reports suggested the candidates—amidst their a heated contest in the Iowa caucuses—almost scotched the debate deal over issues they might not even have disagreed on, such as whether to hold debates in Brooklyn and Flint, Michigan. Ultimately, however, the deal held. When parties have difficulty building trust in negotiations, they often fail to identify interests that they can trade on for creating value in negotiation. In negotiation, we need to resist the tendency to view our adversaries’ proposals with suspicion, lest we pass up a win-win deal. Trump Does Not Really Mean It – There Just Opening Bids. While Trump spouts outrageous campaign rhetoric – ship 11 million illegal immigrants back to their homeland, build a wall across the border – now 10 feet taller, ban religious groups from entering the country – he doesn’t really believe in the slightest that he will attain any of his goals if unfortunately elected. “Trump views the presidential campaign as just one big negotiation – start outrageously high and slowly roll”back. These platitudes are merely Trumps starting position in his negotiation strategy much like a street vendor who quotes several hundred dollars for a fake Rolex but allows you, in the end, to buy it for a mere $50. You walk away feeling like you got a good deal and the street merchant pockets $45 in profit – everyone’s thinks they’re happy. Trump is using the classic negotiation technique of anchoring. The sadness is that Trump’s anchor is mired in fear and hate.